Software is compatible with all windows versions like Win 10, 8, 7 etc. With the help, if EML to lotus notes converter, it is possible that the users can select the entire folder of EML messages at a time. This software creates one single NSF file containing all the emails saved in it. Moreover, when saving EML data files into NSF format then, the software will keep all email attachments associated with NSF file type. During EML to lotus notes conversion, the software offers a feature that permits to select an appropriate name for Lotus Notes NSF file. Whatever name will be used by the software pane to store NSF file within it. Once the EML to NSF conversion begins, then, the software will create an instant summary report for the same. This report will contain complete details such as name of the exported folder, name of EML file being converted and moved email count. EML file format is the widely used by a large number of applications to save each email. Such mails are composed of various email addresses in To, Cc, Bcc along with, formatting, hyperlinks, images, graphics and other Meta properties. 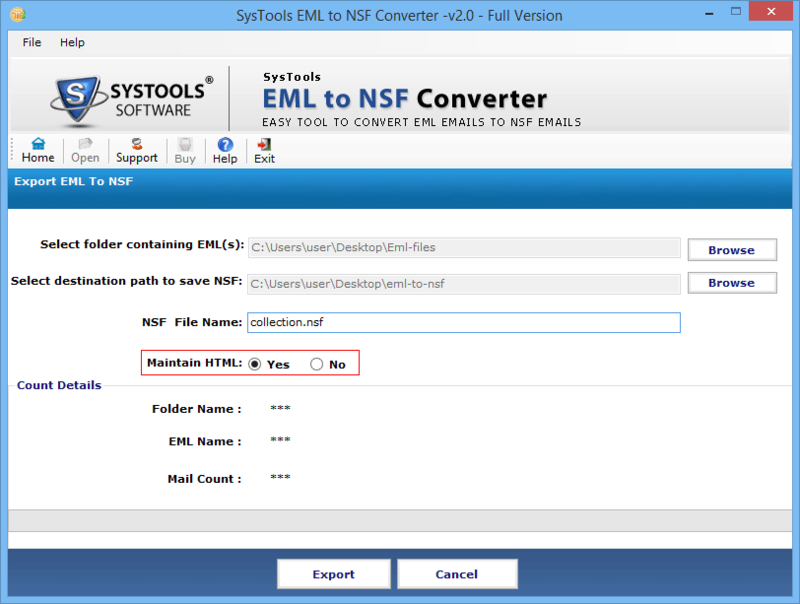 Although, the eml to lotus notes converter software keeps all information intact while importing emails into NSF format. 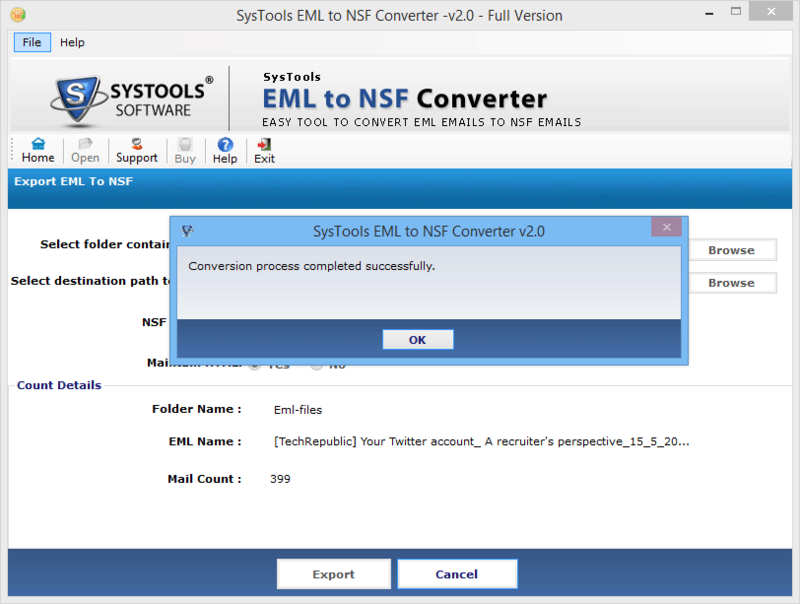 The EML to NSF Converter Software permits the user to save NSF file at any desired location as per users need. Moreover, if required then, the users can directly create a new folder from the software pane with the particular name and save all files into it. Does this application move multiple EML messages into NSF file format? Yes, Of course, with this application the users can transfer single or multiple files into NSF format at once. Does the installation of Lotus Notes application required before migration? Yes, Lotus Notes 9.0 or below version are must before conversion process. 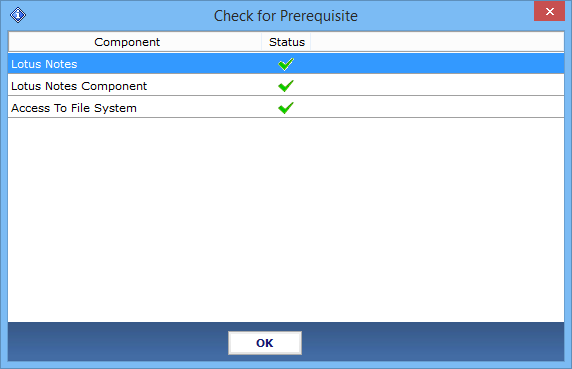 It must be configured properly as well. Does the conversion software impose any file size limitation for converting EML files in NSF format? No, there is no any file size limit during the conversion of EML data into NSF format. Even a user can add any number of .eml files to the software for performing the migration. Will this application migrate attachments along with emails while conversion? Yes, this software converts all emails and attachments successfully into NSF file format. Is this software maintains the HTML formatting while EML to NSF conversion? Yes, it will provide with this optional feature through which the users can maintain the HTML formatting without any data loss. Does this utility compatible with Windows 10 operating system? 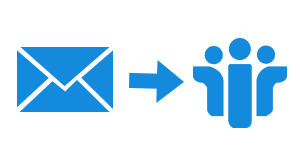 Yes, this utility supports Windows 10 and all its below versions as well. 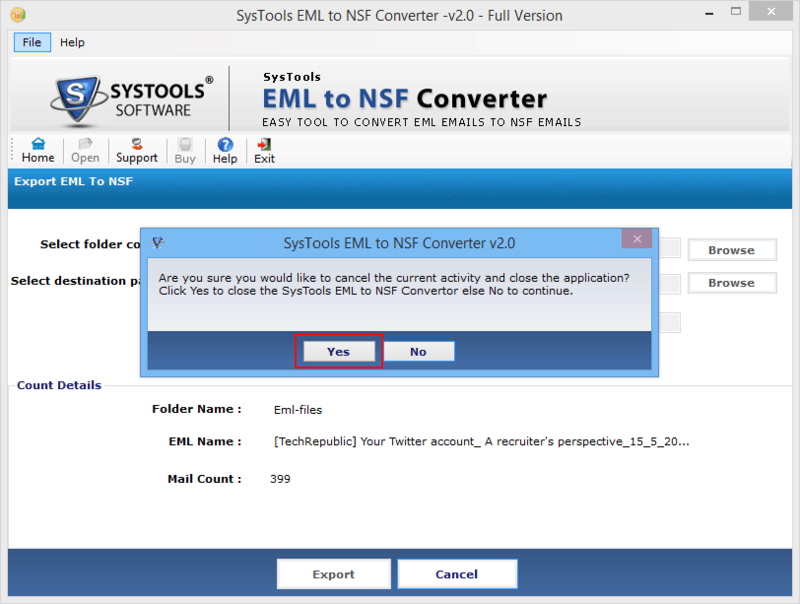 Launch EML to NSF Converter on your system and it will check for all Prerequisites. Now, click on Open to add the eml file to the software. 3. 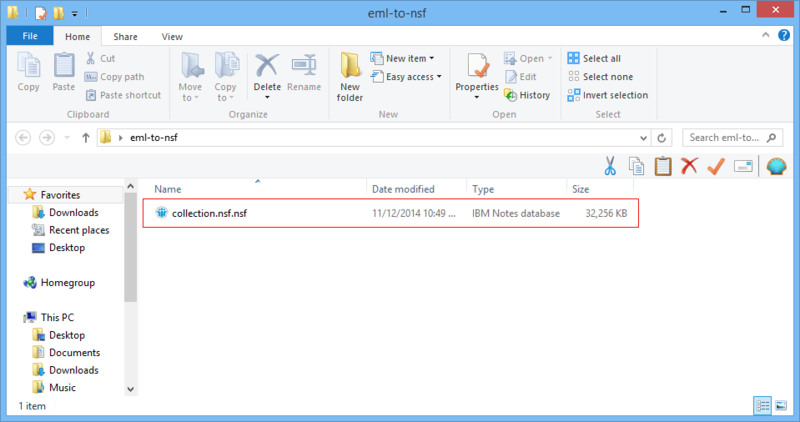 Now click on first Browse button and choose the specific folder containing EML messages to be exported. Also, screen will show the destination path where NSF file to be created and this option will maintain FTML formatting & total items. Next, hit on Export option to begin the EML to Lotus Notes conversion process. "I have used lots of software applications till date. But did not get any feasible solution through which I can export bulk on emails in NSF format. After facing such type of issues, I came across one such amazing tool i.e. 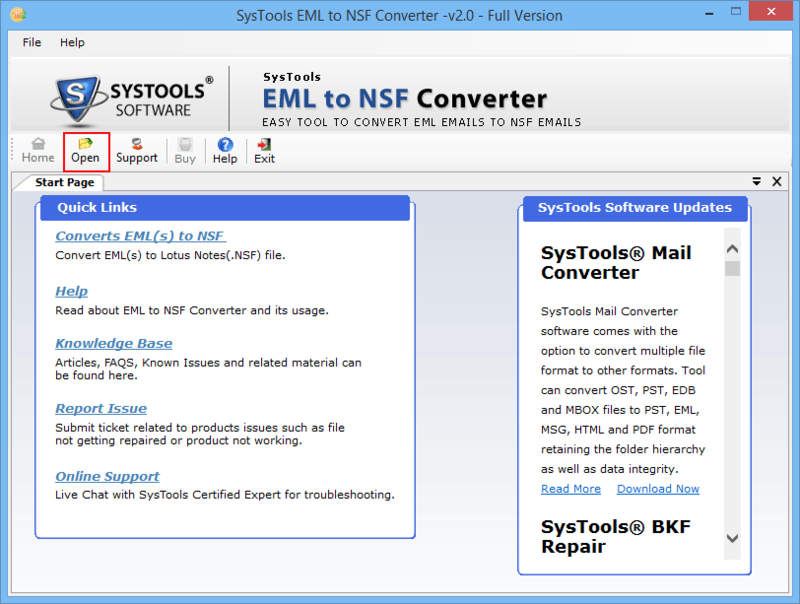 EML to NSF converter that can resolve my all problems. Also, this tool enables to migrate a single as well as multiple files in NSF file type. Truly said, it is a reliable and one-stop solution to perform the conversion." "From Past few weeks, I was planning to convert data from EML to Lotus Notes NSF format. But I was not getting the satisfactory outputs while moving each email in just a few clicks. Then, I found such a wonderful EML to Lotus Notes conversion tool that helps to complete the entire migration process efficiently. This application offers a hassle-free solution to perform data conversion in NSF file format. Great work!!"